Japanese Mazda fans get a new MX-5 special edition to play with. 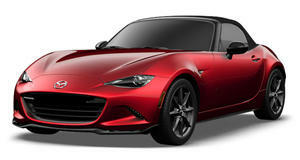 Mazda has come up with a special edition MX-5 roadster exclusively for the Japanese market based on the RS RHT and VS RHT premium model trims. Boasting the pioneering power and extremely popular retractable hardtop (RHT), the iconic, lightweight, 2-seater open-top sports car, previously known as the Miata, has been given some unique features such as a Brilliant Black roof & door mirrors, similalry colored front grille garnish, and Gun Metallic 17-inch alloys. This special edition roadster is available in two exclusive colors: Velocity Red Mica and Spirited Green Metallic in addition to Mazda&apos;s popular Crystal White Pearl Mica. Interior enhancements include black leather with sand-color stitching seats and steering wheel and a Bose sound system. Originally launched in 1989 and now the best-selling 2-seater sports car of all time, the distinctive Black Tuned MX-5 is powered by a 2.0-liter DOHC engine and mated to a six-speed manual or automatic transmission. It is currently on sale now across Japan, but pricing wasn&apos;t released in Mazda&apos;s official press release.